Introducing the Arm Skeleton with Scapula and Clavicle by 3B Scientific. 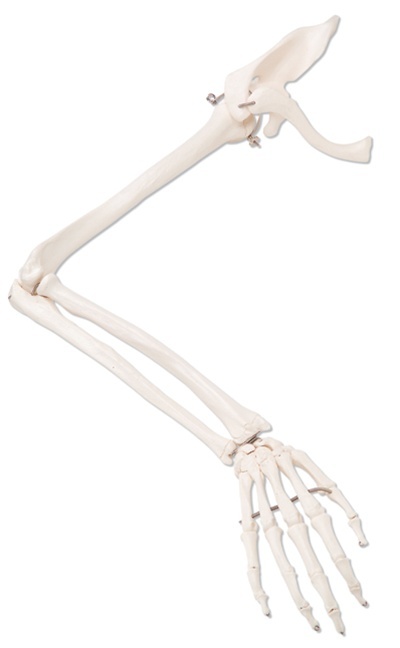 It is a high-quality hand and shoulder skeleton model brought to you by the industry’s pioneering company in the field of manufacturing and distributing anatomical models and teaching aids used for scientific and medical training as well as for patient instructions. Anatomical models from 3B Scientific are skillfully handcrafted by trained personnel adhering to strict medical standards to bring you first-rate products. Which makes it perfectly ideal as an educational teaching tool for professors, lecturers, and medical professionals as it provides auxiliary education to students of anatomy and physiology. This will surely add value to any bone collection. This arm skeleton bone version includes the clavicle, also known as the collarbone as well as the scapula which is popularly referred to as the shoulder blade. • It is set on a wire and slightly elastic down to the fingers. • The elbows and shoulder joints are also elastic. • This flexibility allows for an exhibition of natural movements of the upper limb. This partial skeletal model is scientifically accurate because it is cast from a natural human bone specimen. And because of that, it is the next best substitute for a genuine bone. This replica is made of a high-grade plastic that is durable and unbreakable. SCIENTIFICALLY ACCURATE- This partial skeletal model is scientifically accurate because it is cast from a natural human bone specimen. HIGH QUALITY- It is made of a high-grade plastic material which makes it the next best substitute for the genuine bone. IDEAL EDUCATIONAL INSTRUMENT- It is perfectly ideal as an educational teaching tool for professors, lecturers and medical professionals as it provides auxiliary education to students of anatomy and physiology. This will surely add value to any bone collection. FUNCTIONAL- This arm skeleton bone version includes the clavicle, also known as the collarbone as well as the scapula which is popularly referred to as the shoulder blade. It is also set on a wire and slightly elastic down to the fingers while the elbows and shoulder joints are also elastic. This flexibility allows for an exhibition of natural movements of the upper limb. PACKAGING- Right or left arm skeleton bone model depending on availability.